At Fisher Glen Animal Hospital, we provide veterinary surgical services from routine spaying and neutering to non-elective procedures such as emergency and orthopedic surgery and wound repair. Above all, we believe in compassionate, stress free care for your furry little family members. Because of this, our emphasis is on keeping your pet as safe and pain free as possible. Click Here to learn more about spaying and neutering at Fisher Glen Animal Hospital! If your pet is about to have surgery, we recommend that you consider microchipping your pet for identification purposes! It provides you with more peace of mind should your pet ever get lost. We understand that it can be stressful to have your pet undergo an anaesthetic procedure, particularly if they are sick or geriatric. However, modern anaesthetics are extremely safe when administered carefully. Consequently even our oldest of patients can be safely put under for procedures. More often than not, the risk from not having a required surgery far outweighs the risk of the anaesthetic. It is important to know, however, that there are risks to any surgery, no matter how healthy your pet. An extremely small percentage of animals may have a negative reaction, the same as some humans do. But there are ways to decrease risk, and at Fisher Glen we take full precautions for all surgical procedures. First of all, we perform a pre-anaesthetic blood screen prior to any surgical procedure. We do this to ensure that your pet is healthy enough to undergo surgery. A pre-anaesthetic blood screen allows us to assess your pet’s overall health, particularly the function of vital organs such as the kidneys and liver. Any abnormalities can affect the way that your pet handles the anaesthetic, and in many cases influences our choice of anaesthetic. Additionally, we routinely use intravenous fluids for all surgical patients. Intravenous fluids keep up the blood pressure and the rate at which the kidneys are supplied with fluid. This helps to protect them during the surgery. 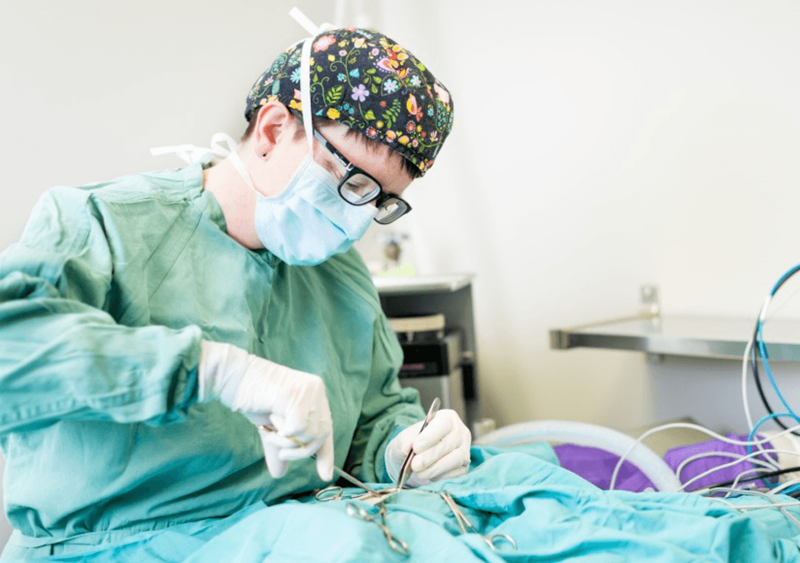 Animals that are on intravenous fluids while under anaesthetic are able to flush the anaesthetic drugs out of their system quicker, and typically have safer and faster recoveries. Pain control is a critical part of your pet’s recovery from illness and surgery. Quite simply, the more comfortable they are, the faster they recover. It is important that patients eat and move around after surgery to keep their digestive system working and to keep their muscles and joints from seizing up! Pain control has come a long way in veterinary medicine over the past 15 years. We now realize that pets probably feel pain in much the same way that we do, and, like us, they each have their own pain threshold. There are the really stoic ones, and there are the wimps! We monitor your pet’s pain level continuously while they are with us, to ensure that they are comfortable after surgery. Additionally, we practice what is called multi-modal pain therapy, which means that we target different parts of the pain pathways with different types of drugs to provide maximum relief. Typically we also discharge patients with anti-inflammatory/pain control medication, to be continued at home for a few days. When your pet arrives at the clinic in the morning, the veterinarian will closely examine them. They will assess their present condition to determine what sedation and anaesthetic agents will be used. We will then sedate your pet, and may also place an intravenous catheter at this time. Additionally, we may administer pain medication at this point so that it is working during the surgery and as they wake up. Next, we give your pet an intravenous agent to start the anaesthesia, and place an endotracheal tube in their windpipe to deliver oxygen and the inhaled anaesthetic that will keep them under for the procedure. At Fisher Glen Animal Hospital we closely monitor the heart and respiratory rate, EKG, temperature, blood oxygen level, carbon dioxide level, and blood pressure of each anaesthetised patient. Our veterinary technician does not leave their side. We use state-of-the-art monitoring and warming equipment to ensure that your pet is safe and comfortable throughout their procedure. We also closely monitor their recovery, with particular care paid to their body temperature, as smaller pets can become hypothermic quite quickly when under anaesthetic. You will receive a phone call from the veterinarian as soon as your pet is waking up! While you’re here, why not learn about all of the other Veterinary Services we offer here at Fisher Glen Animal Hospital? You can also visit our Blog for all the latest news and content from Fisher Glen Animal Hospital! Finally, Contact Us if you have any questions about veterinary surgical procedures. We will be happy to answer any questions you may have!